I am lucky enough to live in a phenomenally beautiful part of Bavaria. In a tiny village called Aufkirchen, dominated by the Mariä Himmelfahrt Kirche and poised elegantly on the top of a hill. On a clear day, I can see the Alps. I used to think water was my creative liberator but mountains seem to have a huge influence on my writing and art. I feel so free and clear here. I can breathe life without having to live it. A wondrous thing for an introvert. We have a group of clean white tents for refugees down the hill in the next village of Berg. They flutter uneasily in the sun and you only ever see the refugees when they shop in the tiny little supermarket, Rewe. There is a weird atmosphere, dark looks and mutterings amongst the indigenous Bavarians. This isn’t cosmopolitan and liberal Berlin, this is Upper Bavaria, Hitler’s old heartland and a stone’s throw away from Berchtesgaden, The Eagle’s Nest. I’ve talked, as unobtrusively as possible, to some of the people who live here. What they say publicly and what they think privately are very different but mostly it is ‘we didn’t get asked’, ‘what about the crime rate?’ and ‘I’m young, I want to help those who really need it be will there be any jobs for me?’. I think about the refugees a lot. I think about how easy it is in the UK because we don’t have that black and stinking stain of the Holocaust. Yes, we have other stains but not like that one. Nobody else has one like that one. Even Stalin, who was a sadistic freak and murdered millions of his own people, is considered less evil than the perpetrators of the Holocaust. There are several monuments to the victims of the Death Marches or Todesmarschmahnmal. I find them ugly, stark things and they make me shudder. I expect they are supposed to although I find German Art a confused and curious thing. An Arrested development for 10 years, I’m not sure it has ever recovered. 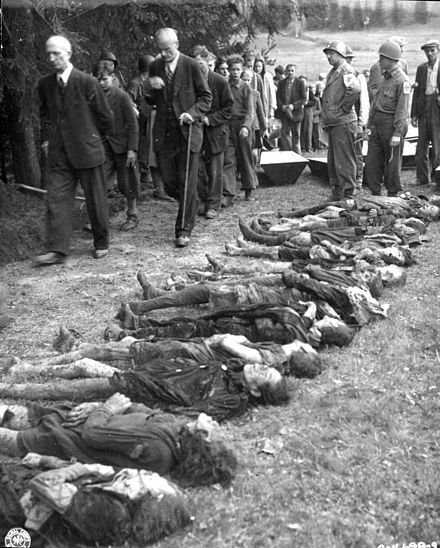 These forced evacuations were how the Germans who worked in or controlled the Concentration Camps hoped they could hide the evidence of their mass murder. These evacuations continued until the last day of the Second World War. The very last day. When I drive or walk through one of the roads that the Jewish prisoners would have trudged I am filled with a desperate sadness. Sometimes, I can imagine ‘ waves of striped or black, filthy clothing lining the road and parting for me as I drive through them. I wonder if I would have been brave enough to throw food or shout support? I hope to God, yes. I wonder what the villagers of Aufkirchen, Berg, Percha and others must have thought if they had witnessed this uniquely murderous event. Did they stay indoors and pretend not to listen to the stumbling footsteps and the occasional brutish shout or gun shot? Did they stand proudly watching the ‘vermin’ getting their just deserts? Were they overwhelmed with what they were feeling internally and how they were supposed to express themselves to The Reich? Holocaust memorial sources say very few civilian helped in any way except to take clandestine photographs. The beauty of this region makes it so much more insidious for me. But beauty and horror are often intertwined in life and in the arts. One made more powerful by the other. In my own way, with my daily walks and remembrance, these are my tribute to those who died in this beautiful part of the world. Their blood forever painting the Bavarian soil, fertilising the crops and feeding the german livestock that we eat every day. For me, this is a far more powerful monument and a more enduring remembrance than a carved stone edifice and paragraphs in dusty history books. In memory of those who perished during the Holocaust. God Bless you all. This is beautiful writing about something so difficult and ugly. I was in the US recently when the Pope was there, canonizing one of the Spanish missionaries, Junipero Serra. And I thought, how do you anoint as a saint a man who was an inquisitor, complicit the enslavement of native people, in genocide? And how do people, knowing what we know now, excuse, much less celebrate this? I don’t know how people turned their backs then. Now, I think it’s a feeling of a personal powerlessness against the machinery of the world. Maybe then too. I imagine to be a German then, one who personally opposed the atrocities being committed, must have been isolating–when everyone around you seems on board with it, and the specter of informers are everywhere, I think even good people must have been broken by the invasive feeling of powerlessness, the knowledge of the futility, that just one person couldn’t stand against the momentum of the holocaust. There’s a part of me that thinks you should oppose injustice and oppression even if it means your own destruction, even if it endangers everyone and everything you love. But I don’t know how that idealism would hold up in a place and time where I was faced with that choice as a concrete reality. I might choose silence. I might choose to pretend I didn’t see. I don’t know. I’ve been watching these documentaries… the parallels between some of the European attitudes toward the Jewish refugees of the 30s and now toward the Syrian refugees are disturbing.